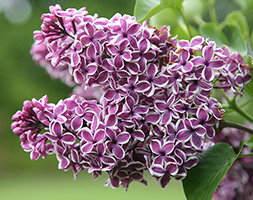 The single, rich purple-red flowers of this rare lilac have a distict white edge to each petal creating a beautiful bi-colour effect. They are highly fragrant and appear in great trusses in late spring when they will fill the air with their sweet scent. Ideal for wildlife-friendly gardens, these much-loved shrubs can also be trained to form small trees.